DELTA Power Equipment Corporation (DELTA PEC) is a well-known in woodwork business. They have expert engineers who make sure the products are user friendly and severs the best purpose. Delta 40-694 20-inch Scroll Saw is one of their products and I am going to tell you what the product has to offer and how you can use it to give the idea inside your head a beautiful shape.You can trust the brand and this is not the only product manufactured there. The company has expertise in manufacture of electric table saws, band saws, radial arm saws, scroll saws, drilling machines, jointers, planers, mortisers, lathes, grinders and dust collectors. I am sure, by the looks of it, the machine looks well designed and crafted and safe to use. It sure is. Machine is designed to get the best out of a piece of wood which means that design you have in mind can be rightfully put on a piece of wood. It gives all the comfort and precision. Blades are the first thing that get spoiled. I am sure you are have thrown away many razor blades just after a use. Blades chemically react with the air and causes rusting. Delta 40-694 20-inch Scroll Saw has safe place for the blade so that after use it is put right back in the holder. Delta saw has a tilt plate and vibrates less and speed variation is a boon. Not much problems you will face with Delta 40-694 20-inch Scroll Saw. Yet, it is a machine and demands well keeping. You need to keep in cool dry place and wear and tear may cause reduction of machine life. Speed is very important as the design heavily depend on the speed of the blade. 400-1,750 SPM is offered by Delta 40-694 20-inch Scroll Saw. This wide range of x speed will help in getting a wide variety of cut on the wood and helps produce finest pieces of art. Dual parallel link arm helps in minimising vibration which I am sure can be very irritating and disturbing while you are working on the wood piece. Dual parallel link arm also prevents any kind of over cutting and undercutting on the wood piece. While changing the blade you can lift and lock the upper arm. Presence of tool-free blade clamp helps in easy changing of blades not consuming more than a couple of seconds. Bevel level is around 45 degrees both in right and left direction. Number of handles are two. 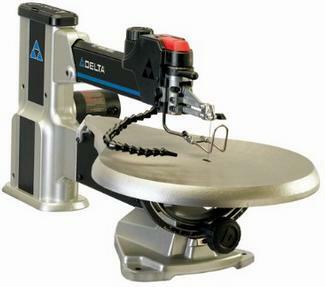 Delta 40-694 20-inch Scroll Saw offers 5 Year Limited Warranty. Scroll saw has blade storage which is located in the toll itself. It protects blades for long lasting use. Angle is fundamental in getting the precision in designs and for this saw has a tilt table. Dust control hose helps in clearing out the debris. Accumulation of dust could be distracting and the designers of machine had right idea about it. Dust control hose are life savers.